Amanda Jackson Band: Haviland Series Continues W/ Mike "Cheapfeet" Dixon! Haviland Series Continues W/ Mike "Cheapfeet" Dixon! Wow! It's hard to believe that July has come and gone already! We had a great July with some fantastic shows at The Dunk, with Souris Live Inc. at their new venue "The Centre Stage" and we wrapped up the month as guests at the Close to the Ground with Fiddlers' Sons series at the Kaylee Hall, Pooles Corner last evening. We're very thankful to Hal Mills, Anne MacPhee and Eddy Quinn for inviting us to play! Looking ahead at August, we will be performing at a wedding for very special friends of ours, heading down to the Old Home Week grounds for The Sounds of the Island series as the trio and continuing our own series at The Haviland Club with the whole gang! 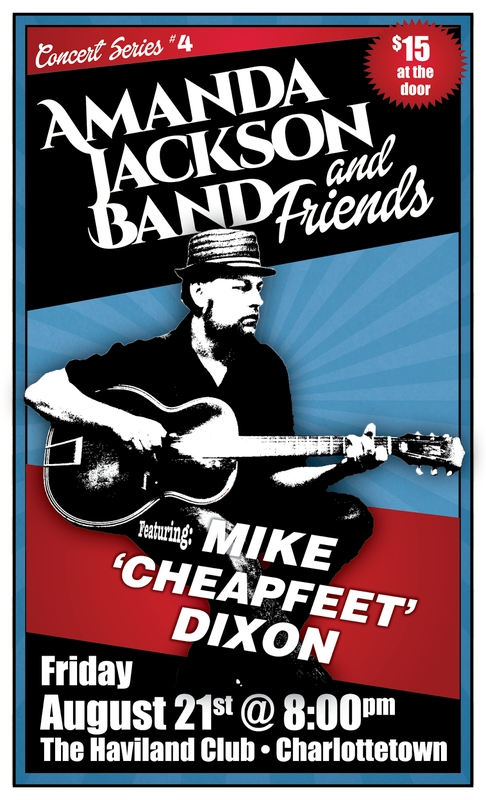 For this 4th edition of the Amanda Jackson Band & Friends Concert Series, we are so pleased to welcome the multi-talented Mike "Cheapfeet" Dixon! Mike "Cheapfeet" Dixon is a singer-songwriter & 21st century songster. He performs Blues, Folk, Pop & Old-Time as well as original material on acoustic 6 & 12 string & banjo guitars. His performances are a rich mixture of familiar & novel sounds; confessional originals beside joyous roots music from the Jazz Age. Mike has appeared on many stages including The Indian River Festival, The Harvest Jazz & Blues fest, Stanfest, Dutch Mason Blues Fest & he has won ECMA & PEI Music Awards with his Americana group, Saddle River String Band. His solo recordings include 'Five times', 'Pop & Chips' & the 2014 EP, 'So Low'. Mike's as real as it gets and we can't wait for this show! Admission is $15.00 at the door.